BioShock 2's newest viral marketing campaign will make you wish you were active on the 2k Games forums. The clever viral marketing campaign for BioShock 2 is giving me hope that the game will be more than just BioShock with Big Sisters. You could spend an afternoon going through everything on http://www.somethinginthesea.com alone, and having wine bottles, seemingly from Rapture, "wash up" on random beaches was a cool idea even though they just ended up on eBay. Now, members of the 2k Games forums have reported two deliveries right to their real-life homes that are both tied into the game's storyline. The first surprise these lucky members received was a telegram delivered by a Speedy Brothers Telegram courier, wearing retro-ish garb no less. 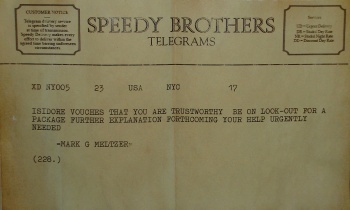 The telegram said: "ISIDORE VOUCHES THAT YOU ARE TRUSTWORTHY BE ON LOOK-OUT FOR A PACKAGE FURTHER EXPLANATION FORTHCOMING YOUR HELP URGENTLY NEEDED," and was sent from a Mark G. Meltzer. From exploring the previously mentioned www.somethinginthesea.com, you can find out that Meltzer is an important figure of some kind in BioShock 2. Phil Isidore (of N.U.F.O.S.) has vouched that you are a trustworthy individual. Please- closely guard the contents of this package. I have sent it direct via courier out of concern that gov't personnel or unknown individuals may attempt to intercept it. As you may know, I have been investigating anomalous phenomena related to the disappearance of my daughter. In the past, you've provided information that has helped my research. Now I need your input on a matter of utmost urgency. I discovered the enclosed item in a basement workshop owned by Orrin Oscar Lutwidge. I'm desperately trying to uncover more regarding its origin, manufacture, etc. Please examine and let me know what you make of it. Any information could help me find my daughter. If the wine bottles ended up on eBay, time will only tell when these masks will go up too, though anybody in their right mind would keep that kind of treasure forever. BioShock 2, which will be released on February 9, 2010, probably doesn't need much viral marketing help due to the popularity of is predecessor, though with videogame sales nowadays nobody really knows. I have to say though, this type of campaign does give me an inclination to take a closer look at the game, so it's definitely working on me.